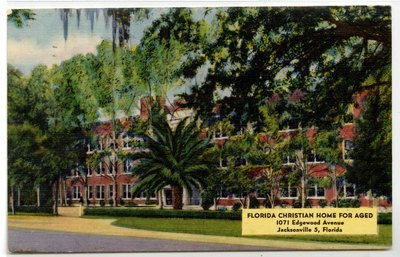 "Florida Christian Home for Aged 1959"
On the Back: 1071 Edgewood Avenue S, Jacksonville, Florida. One of the Homes of the National Benevolent Association of the Christian Church of which 7 are for children and 8 are for aged people. this home has a capacity of 75 aged men and women, who are guests of the Christian Church (Disciples of Christ).